This is review No. 13 of 16 in the first round of our competition. Each review will compare four burritos, with my favorite advancing to Round 2. This week I begin my journey through the final region of the Burrito Bracket: California. Nate Silver described the entire region as the grupo de la muerte, but I would contend that the subset of restaurants I’m reviewing here deserves that distinction. Four historic burrito-selling establishments, four very different burritos, each a near perfect interpretation of its particular style. The first thing I noticed driving up to Manuel’s, the No. 4 seed in our California region, was the fantastic signage. A metal sign with lightbulbs in the shape of a comet flashed from the top of the building. At eye level, a poster depicted founder Manuel Rojas in a boxing pose, with this quotation: “It’s all about mind over matter. If I don’t mind, it doesn’t matter.” A beautiful altar to the Virgin Mary stood in the corner of the parking lot; El Tepeyac is the name of the hill where La Virgencita appeared to Juan Diego in Mexico. Behind dark glass windows covered in metal bars was a humble (and yet oddly glamorous in an Old LA kind of way), diner-like interior. Shiny metal chairs with red seats and mint-green valance curtains brightened up a brick-walled, terra-cotta-tiled room. I sat on the outdoor patio, which had stucco walls lined with red-painted wood. Spanish-language country music and ranchera played on the radio. 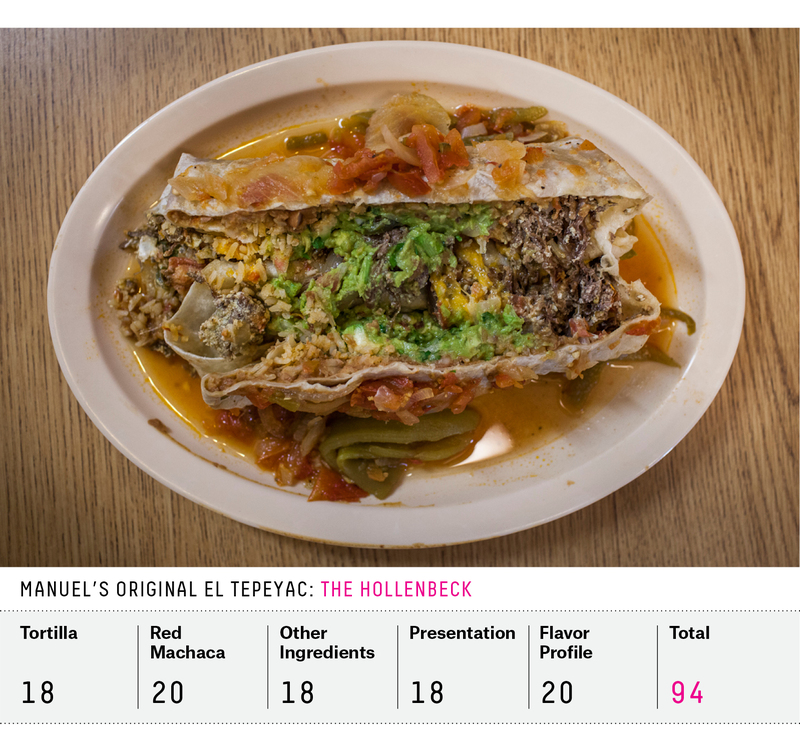 I ordered the restaurant’s signature dish, a Hollenbeck burrito. (The name is derived from a wealthy banker who lived in the area before it was part of Los Angeles. A park and a school in the neighborhood bear the same name.) It came served on a tan plastic platter and took up almost every inch of the plate. It was of comical size. A fresh, griddled tortilla was wrapped around red machaca, Mexican rice, refried beans, a cup full of guacamole and cheddar cheese. It was bathed in Ranchera sauce made of thick slices of mild jalapeño, onion, liquidy tomato juice and chunks of roasted tomato. The ingredients weren’t mixed together so much as piled throughout the burrito. I made my way through the dish, gathering the ingredients for each bite from different sections. I dined with three friends, and they all had leftovers. (I didn’t because they had eaten off of my plate. They’d ordered burritos other than the Hollenbeck and deeply regretted those decisions.) The waiter teased us about how little we’d accomplished, but then remarked that he eats at Manny’s every day and can’t eat the burritos anymore. They are just too much. Only then did he tell us about the availability of the “footlong,” a burrito so big it feeds three to four people. 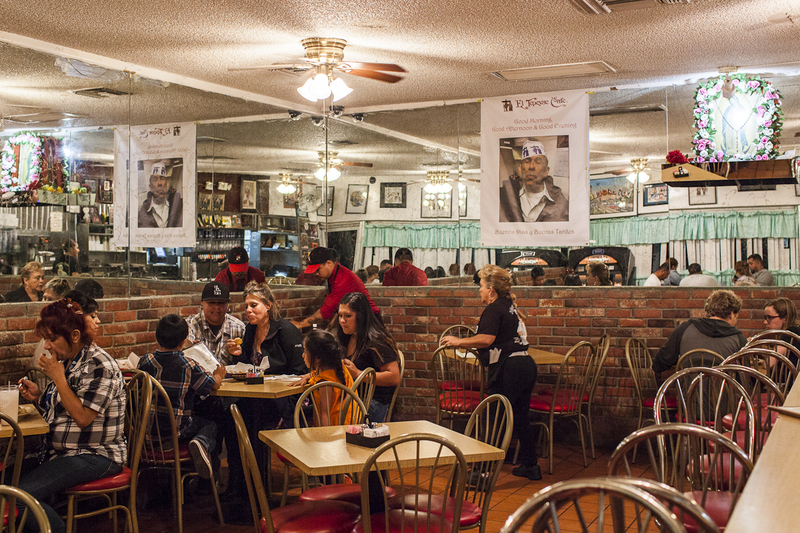 Like Manuel’s Original El Tepeyac, Al & Bea’s is in Boyle Heights, just a couple of blocks from Hollenbeck Park. The neighborhood is located on the east side of the city (not to be confused with East LA), and is 95 percent Latino, according to the 2010 census. 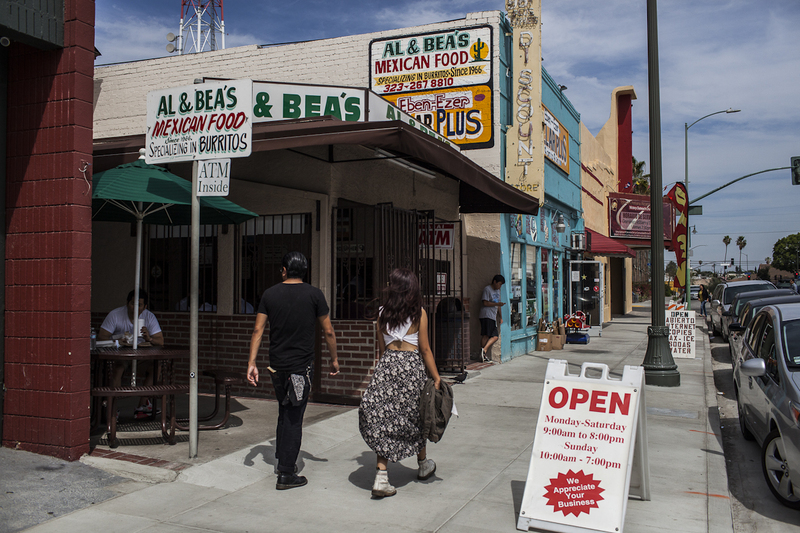 Al & Bea’s has been in business for nearly 50 years, and is a mainstay of the neighborhood. Locals and regulars gather from open until close. When I made a recent lunchtime visit, the women next to me scratched off lottery cards and chatted with the chef. A family of four laughed at inside jokes and lingered long after they’d finished their food. A young couple, on what appeared to be a first date, tried not to be awkward about the mess they were making with each bite. Facing the street are a tiny patio with a few tables and a kitchen barely wide enough for two workers to squeeze by one another in their ongoing dance to churn out orders. A larger freestanding room in back holds cauldron-like pots atop low flames, where beans cook for 16 hours before they’re served. Behind the seating area is a house where members of the owners’ family live. Two sliding windows off the kitchen are for placing and picking up orders. 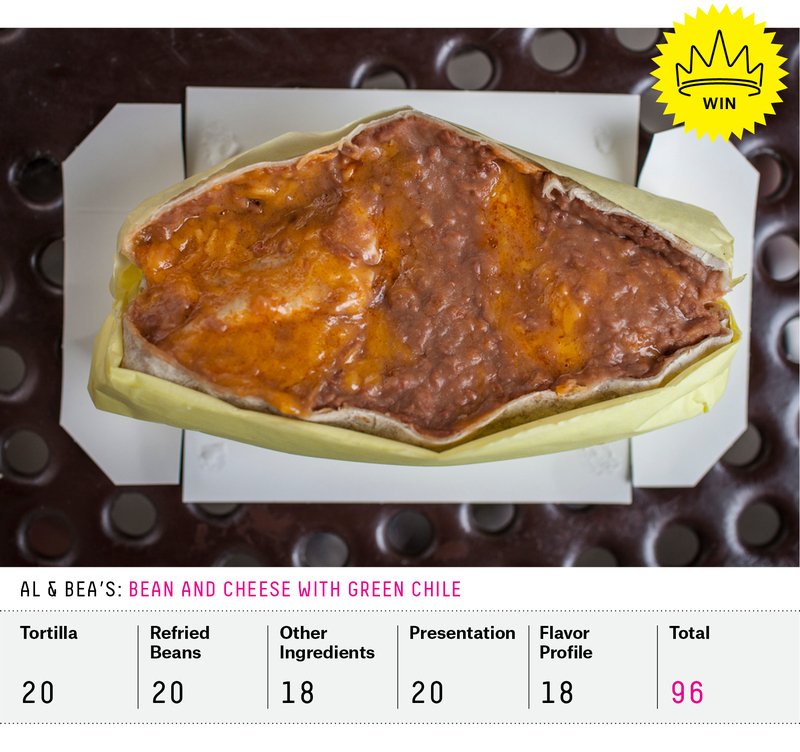 I was there to eat a simple bean-and-cheese burrito with green chile. I expected to be delighted, but instead I had a culinary epiphany. I ordered and received what was essentially a thick bean-and-cheese soup wrapped in a fresh, floury tortilla. This burrito feels like a waterbed when you touch it. If you hold it too tightly, the ingredients ooze out into an irreparable mess. The green chile is almost the color of the beans, and the two blend together seamlessly, the chile almost imperceptible except for the hint of picante it adds to the dish. The beans are velvety in texture and earthy in color. It is the rare recipe that can achieve such depth with so few ingredients, let alone ones so humble. Cheese provides a pop of color in the otherwise ubiquitous mass. All this for $3.50. I arranged to meet Burrito Selection Committee member Gustavo Arellano at Athenian III in Orange County. The sign out front also reads “Don Carlos #5,” but I had been informed that no one calls it that. When we walked in, Gustavo explained why Athenian is America at its finest: It’s a Greek diner that was bought by Mexicans and serves gyros, burgers and burritos. Orange County is confusing, with its lifestyles of the rich and famous and its poor, its beach and its sweltering inland heat. I wasn’t even sure what to call it: The OC? Orange County? Gustavo set me straight: OC, no “the” (that article is reserved for referring to highways in Southern California, apparently). The tortilla for Athenian’s breakfast burrito was carrot-orange in color, which is how it comes from Ramona’s tortillas, the owner’s brother Oscar told me. But the color was also enhanced by its time on the grill, which the owner likes to keep seasoned. The Polish sausage — which was cooked into the egg, holding the chunks of meat in place — burst when I bit into it. A thick layer of hash browns was crispy on the outside and mushy in the center. The burrito was prepared and then placed on the griddle until the side with the seam was crunchy, almost hard. It was served with two paper cups of homemade salsa: tomatillo, onion, cilantro and tomato boiled down to a potent and tangy sauce that I added to every bite. My only complaint was that I couldn’t put the burrito down. After we ate, we chatted a bit longer, learning about the restaurant. Oscar explained that his brother had worked at the previous owner’s burger stand, and was given the opportunity to purchase it. Today, the family owns several locations, and each has its specialty. 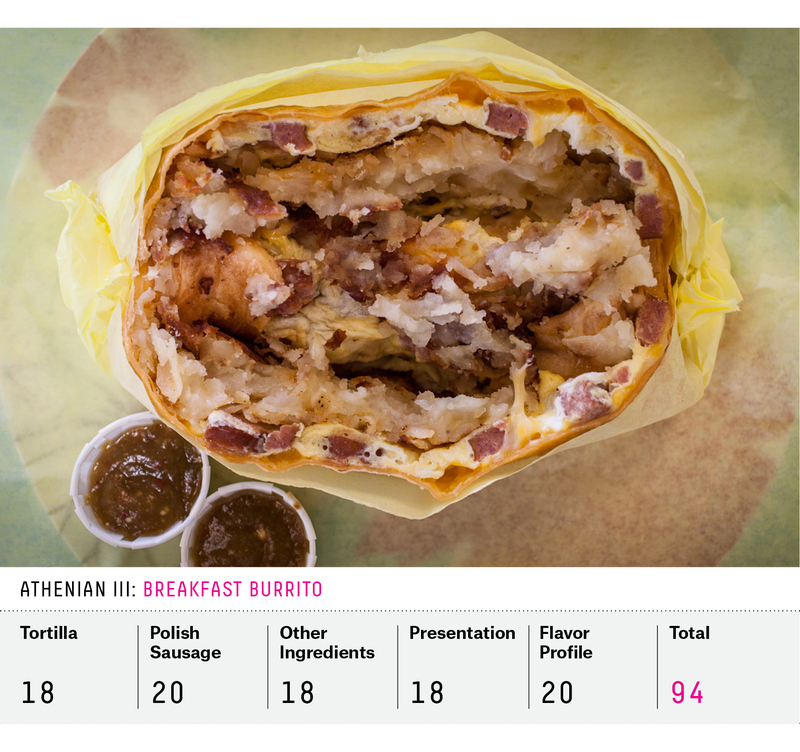 The chile verde at Don Carlos is outstanding, while the breakfast burrito at Athenian III is the star. “You know how it is, every cook has his special touch,” Oscar said. 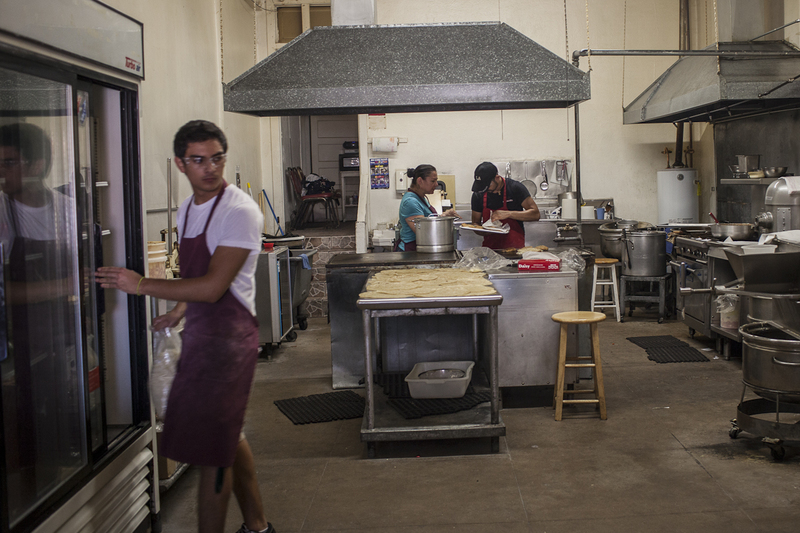 Although La Azteca Tortilleria is famous for chile relleno burritos, as the name would imply, it’s largely a tortilla factory that happens to have a lunch counter. On the day I visited, it was 93 degrees outside. Most of the lights were off and the door was open to keep the space cool. Four workers rotated between stations, cooking in the stark, clean kitchen and working the register. Tortillas covered nearly every surface, lying in wait for the patrons that would stream in throughout the day. A woman behind the register asked if it was my first time there. I told her yes and she welcomed me and explained the menu. I watched her do this with every one of the people who came through the door after me. She also remembered the name of every person who placed an order, and called out from behind the register periodically to check on them. I sat at a counter that wrapped around the wall of the restaurant, below a bright mural of an Aztec god. 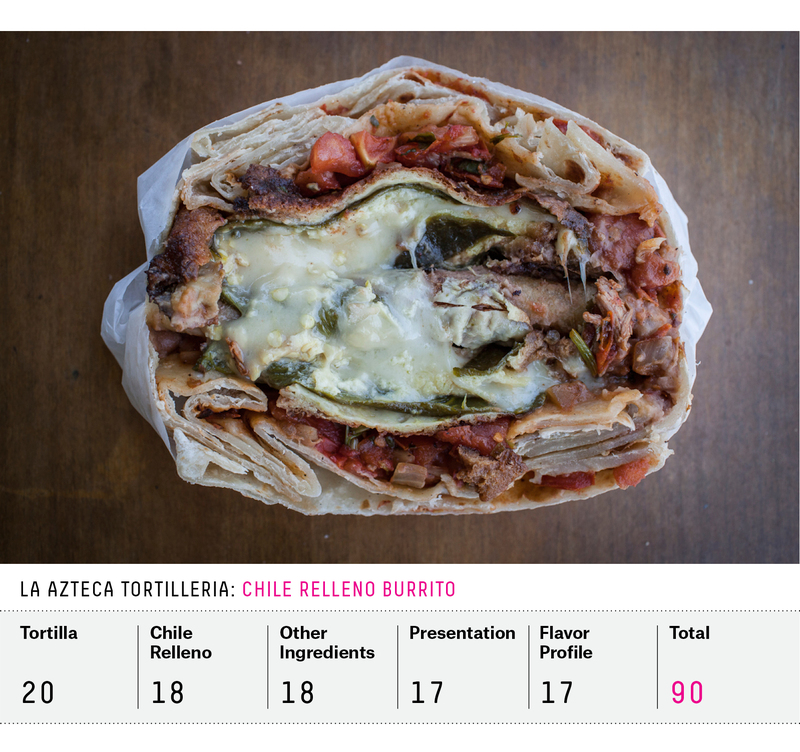 Even though the “regular” chile relleno burrito listed on the menu includes carne asada, the meat’s texture and lackluster flavor can make it a liability, so I ordered it without. Emerald green chiles, battered and fried in a thick crunchy coating and filled with creamy white cheese, ran the length of the burrito. The tortilla — thin, pliable and grilled to a deep brown — was coated with a thin layer of refried beans. A salsa of cooked onion and thick chunks of tomato played off of diced fresh onion and cilantro. The burrito was acidic, almost tart from the chile, tomato and onion, but the luxurious cheese smoothed everything out, while the beans added a hint of sweetness. With a different seeding, this could have been the Final Four lineup. I can’t express my dismay at having to eliminate three of the country’s greatest burritos in the first round. However, I have found solace in knowing that I’ll make a return trip to Al & Bea’s for Round 2.